excipients: a-tocopheryl acetate(vitamin E), propylene glycol, ethanol 96%. Absorption does not seem to occur to any great extent with topical use. Silkaderm is used primarily in the topical treatment of acne vulgaris when comedones, papules, and pustules predominate. 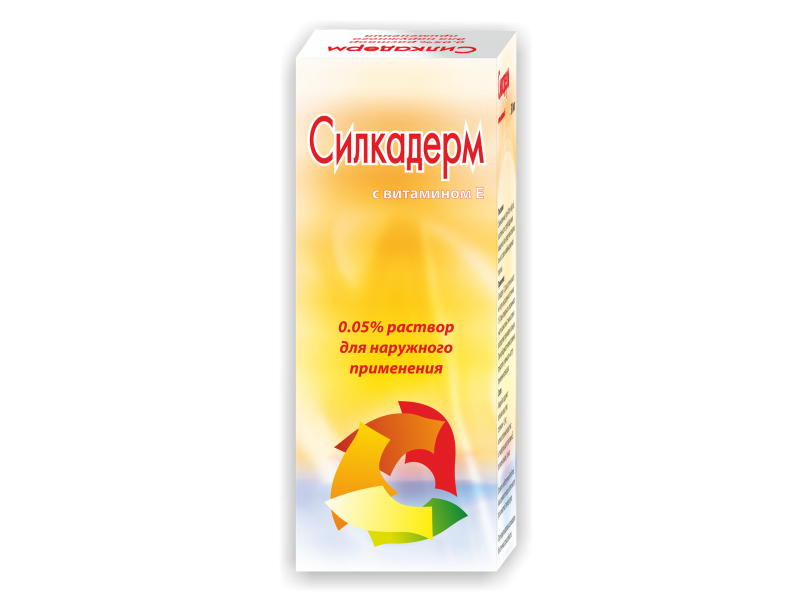 Silkaderm is also used for the treatment of mottled hyperpigmentation, roughness, and fine wrinkling of photodamaged skin. For the treatment of mottled hyperpigmentation, roughness, and fine wrinkling of photodamaged skin: it is applied once daily at night. Effects may not be seen until about 6 months after starting treatment. Silkaderm is contra-indicated in pregnancy in breast-feeding mothers; women of child-bearing age must use effective contraception (oral progestogen-only contraceptives not considered effective). Silkaderm is contra-indicated in personal or familial history of cutaneous epithelioma. Tretinoin is a skin irritant. Topical application may cause transitory stinging and a feeling of warmth and in normal use it produces some erythema and peeling similar to that of mild sunburn. Sensitive individuals may experience oedema, blistering, and crusting of the skin. Excessive application can cause severe erythema, peeling, and discomfort with no increase in efficacy. Photosensitivity may occur. Temporary hypopigmentation and hyperpigmentation have been reported. Exposure to UV light (including sunlight, solariums) should be avoided; if sun exposure is unavoidable, an appropriate sunscreen or protective clothing should be used. Use of Silkaderm with abrasive cleaners, comedogenic or astringent cosmetics should be avoided. Allow peeling (e.g. resulting from use of benzoyl peroxide) to subside before using a Silkaderm; alternating a preparation that causes peeling with a topical retinoid may give rise to contact dermatitis (reduce frequency of Silkaderm application). Safety and efficacy of Silkaderm in adults older than 50 years of age have not been established. Concomitant use of Silkaderm with other topical medications (especially those containing keratolytic agents such as sulfur, resorcinol, benzoyl peroxide, or salicylic acid) should be undertaken with caution because of the possibility of interactions. In patients who have used keratolytic agents, sufficient time should elapse for the effects of these drugs to subside before initiating Silkaderm therapy. Patients receiving Silkaderm therapy should not wash their faces more frequently than 2 or 3 times daily, using a mild, bland soap. Medicated or drying soaps and abrasive soaps and cleansers generally should not be used. Use of topical preparations with high concentrations of alcohol, menthol, spices, or lime such as shaving lotions, astringents, and perfume should be avoided, since they may cause stinging of treated skin, especially during initial therapy. Patients also should avoid the use of irritating cosmetics (e.g., toners, peeling [desquamating] agents), permanent wave solutions, electrolysis, or hair depilatories during topical Silkaderm therapy. Non-medicated cosmetics may be used by patients receiving Silkaderm therapy, but the areas to be treated should be cleansed thoroughly before Silkaderm is applied; medicated cosmetics should not be used. 30 ml of solution is filled into amber glass bottles (inside package). The bottles are packed and inserted with the leaflet into cardboard boxes (outer package).